Pizza, pizza, pizza! Mmmmm who doesn't love the great pizza? This is my favorite vegan pizza recipe! I used to love ordering pizza, it's an American pastime! But the fact that they use so much grease, fat, and cheese doesn't go good in my tummy! Not surprising considering it's one of America's favorite foods, along with hot dogs, nachos, and twinkies. Did you know pizza used to be considered a peasants meal in Italy? Sounds crazy but it makes sense if you think about it. Pizza's aren't the best thing for you, and peasants don't tend to get the top goods. Gourmet pizza is not something you hear about every day. 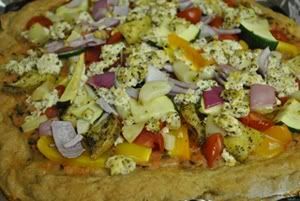 But this vegan pizza recipe is definitely healthier than most and tasty enough for the upper class! Step 1: It's very important to activate the yeast, it helps the dough rise. In a small bowl dissolve the sugar in 1 cup of warm water. Add yeast, give it a couple good stirs, and let sit for 10 minutes. If your yeast was activated properly it should be foamy and fizzy. While the yeast is being activated, might as well prepare the dry ingredients. In the same mixing bowl add 1 tbsp oil and roll the dough in it so it gets a nice oily layer. Cover the bowl with plastic wrap or a towel and let sit for 1 hour. Step 4: The dough should have doubled in size while sitting, give it a firm punch to deflate. Knead dough 2-3 times. Return to bowl, cover and let sit for 30 minutes. Crust makes handling a pizza perfect. If it weren't for crust I think pizza eating would be a whole lot messier. To make the crust fold the dough over on itself to get a little lump and smooth it in to the bottom. This pizza dough can be used later, stored in freezer or in fridge for about a day. If you decide to freeze it for later, the dough should be at room temperature when you use it. Blend everything in a blender until a puree is formed. Step 1: Drain tofu, in a medium sized bowl mush tofu with fingers. Add lime juice, spices, oil, and sugar. Mix ingredients in with tofu using your hands. Mush through fingers until it gets that cottage cheese look. Step 2: Distribute spinach on top of pizza sauce. Then olives, onion, garlic, and tofu. Bake for 10-15 minutes or until crust is golden brown. When ordering pizza, some people give me a funny look when I say "no cheese, please." That's all a vegan pizza recipe is, no cheese and loaded with delicious vegetable toppings. Enjoy!